Nestor Solis, a Postdoctoral Fellow in the lab of Chris Overall at the CBR, attended the 22nd Annual Lorne Proteomics Symposium organized by Australasian Proteomics Society held on February 2-5, 2017 in Lorne, Australia. Funding to attend these meetings was partly provided by Travel Awards from the Centre for Blood Research (CBR). The Annual Lorne Proteomics Symposium is a gathering of ‘omics researchers mainly across Australia but with a large international contingency. 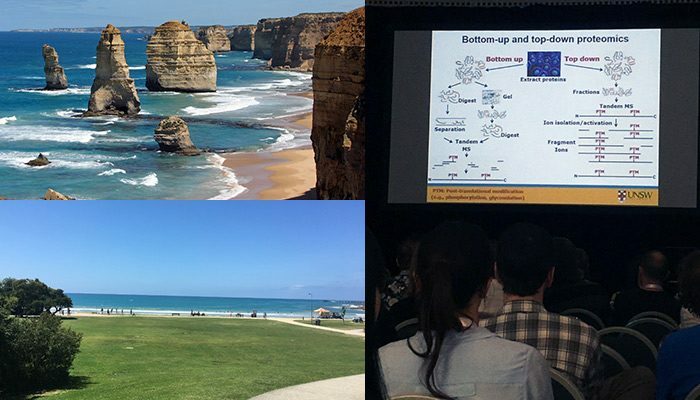 The Lorne meeting is a well-known conference that attracts the leaders of the fields of proteomics, glycomics, metabolomics and lipidomics due to the exceptional scientific programs, fun social events and the gorgeous location of Lorne. Lorne is a beach town on the south eastern coast of Australia, located in the state of Victoria. Not only is the location blessed with fantastic beaches and great weather in February, but is also located on the Great Ocean Road – one of the most picturesque roads in the world. Two hundred delegates attended this meeting and featured a wide array of biological questions and novel technological developments. Current trends in ‘omics research is the integration of various large scale technologies to paint complex and integrated networks of biological regulation. Macromolecules do not act in isolation, and their networks of interactions are now being able to be explored with the unprecedented power that mass spectrometers offer in sensitivity, speed and resolution. A large effort is now dedicated to the characterization of protein interaction networks, characterization of glycan heterogeneity attached to proteins, characterization of intact proteins but perhaps most notably the utilization of targeted mass spectrometric methods to quantify virtually all observable ions in a chromatogram across multiple samples. Utilization of these global methods (e.g., SWATH and DIA) are now allowing the examination of large cohorts and identify potential disease markers. One particular example of targeted proteomic technologies was presented by the keynote speaker Dr Bernhard Kuster. Dr Kuster’s laboratory has recently identified all known human proteins (thus completing one of the first human proteome drafts) but have also now been developing methods for examining activation states for as many kinases possible in the human genome and building large phosphoproteomic networks which are being used in revealing novel cancer signaling pathways. Overall, the Lorne Proteomics Symposium had extremely insightful presentations from leaders of the field, and amazing and novel ideas pursued by students of the society. Most importantly, there was a fantastic interaction between senior ‘omics investigators with those who are only beginning their scientific careers forming collaborations and a strong sense of community.